Rainbow Bridge Remembrance Day ~ August 28. A long time ago, in a decade far away, a Houston cat lover a named Laurence Simon had an idea to help other cat lovers share their blogs and cats with the world. The year was 2004 and the blog was This Blog Is Full of Crap; while the blog no longer exists and some of his cats went to Rainbow Bridge Laurence has a creative writing blog/podcast and still shares his cats with the world on various social media, from time to time. 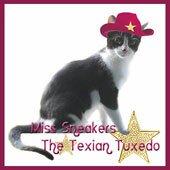 While Sneakers and I have not been blogging a lot, lately, it doesn't mean we have not been busy. One project we have been working on is updating the archives of the CoTC, looking for all active links, even if the blog is no longer itself active. It is those blogs, some full blown cat blogs, some not, that I wish to honor with this post; if anyone reading this knows a blog is still alive, under a new URL, do let me know via email....who knows, if they still have old archives a link can be restored to our list. That's 2 weeks away from now. 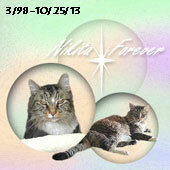 I posted a pictorial tribute to Nikita for Rainbow Bridge Remembrance Day. 1. Over at StrangeRanger...thinking fondly of furrier times. 2. 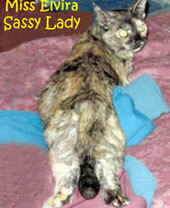 Over at Life from a Cat's Perspective...What Samantha does on the weekends. 4. Over at Sparkle Cat...Happy Anniversary to Summer Samba! 5. Over at Marian Allen's blog...A cat book review. 12. 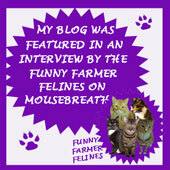 Over at I Have 3 Cats...The gang celebrates being interviewed! 1. Friday Ark #534 (actually #535, hee, hee!) - Cats, Dogs, Birds, Invertebrates, Other Vertebrates and the Extinct! Oh, my! 2. Camera Critters #386 - The oldest active meme about photos of animals/critters! That was really interesting stuff about Laurence Simon. 2004? He was ahead of his time, huh? Thanks for hosting, and for including us, dear pals! 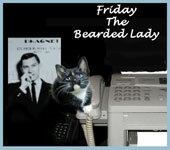 Wow, there was a LOT that has gone on in the world of cat blogs this week! Rainbow Bridge day was very nice even though I cried through every post I read. It is nice to know so many cats were so loved. 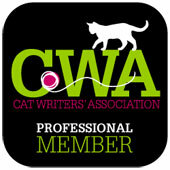 When I gave up the Cat Blogosphere, I gave them the database. I have a lot of the old posts saved, with some effort, I could recreate them. Sadly, I haven't saved any recent ones. Since I was contributing and hosting since the carnival's inception and my blog is still somewhat active, my links all work. I do recognize many of those blogs and I can't think of any that are active. Interesting to see the list of inactive blogs. Makes one wonder whatever happened that they just disappeared. And I must say WOW! 600!! That is quite an amazing number. Yes, so many many platforms have cropped up to share in so many ways, but you've kept the Cat Carnival going through it all. I look forward to that 600th one.